"Nintendo was a tough competitor. I admire them for it. They went to all the third-party developers and said, ''If you support Sega, we won't get you your gamechips on time." Or they told retailers, "If you put Sega games on your shelf, you're not gonna get your new Mario games for a while."" 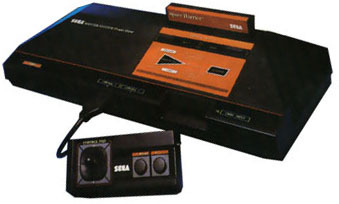 So the Sega Master System did never really get popular. According to The SMS FAQ Sega shared 10 percent of the console market with Atari, and Nintendo ruling the last 90 percent (!). In 1991 Sega released another version of the Master System called Master System II :-) It did exactly the same thing but was designed differently (clearly aiming for the younger crowd, as the Sega Mega Drive (Genesis) was released), and lacks some features. The Sega Master System is technically (and in any other way) better than the NES. Colors 32 different colors on screen (sprites can only have 16), of a palette of 64 possible colors. Audio Standard PSG: Three tone and one noise channel. In most Japanese, and maybe some European machines, a FM-unit is present (Yamaha YM2413). 315-5124 - Used in the Mark III, Sega Master System. 315-5246 - Used in the SMS 2 and later versions of the SMS. 315-5378 - Used in the Game Gear. 315-5313 - Used in the Genesis and Mega Drive." The Texas Instruments SN76489 Programmable Sound Generator (PSG) is built into the VDP, and is identical to the standalone version. It is also used in the MSX and the BBC Micro. The cartridges could officially be up to 4194 Kb (kilobit), but some Brazilian games are up to 8Mb (megabit). These can not be played on all version of the Master System I, unless a bootloader is used. The SEGA Cards can store up to 32 KB. The first computergame I ever saw (or was aware of) was "Cloud Master" (Chuka Taisen) by Taito. I was three or four years old, and I saw the game (arcade version) on a ship. I must've told my parents I wanted such a game, because they gave me (in fact they used "my money") a Sega Master System within a year. It had Hang On/Safari Hunt built so it must've been the "Master" Package (product #3000). I later got "Cloud Master", and has yet to finish it. I grew up, playing the Sega Master System all day. And one day - it got broke :( So I got a new one with Alex Kidd in Miracle World built in. Unfortunately I already had that game on cartridge, and I'm now looking for an SMS with Hang On/Safari Hunt built in. When it was time to go to school I thought I was the only one having an SMS, but within months I found out that this system wasn't as rare as I thought. I knew atleast four at my age who had an SMS. And I knew around three who had a NES. So I actually think that the SMS was as popular, or maybe even more popular, as the NES here in Denmark! As time went by, I still played my SMS while everyone else played SMD and SNES. I even bought a Game Gear to play all my favorite SMS-games in the car etc. At Christmas 1995 I got a Sega Saturn (ohh so happy I where:), and it made me put my SMS away. But now the SMS is my most used console again, and I've started collecting games and accessories for it again.